Anglo-Gallic. Eleonore, Duchuss of Aquitaine. After AD 1189. Silver Denier. Eleonore was wife of Henry II, and mother of Richard the Lion Heart. 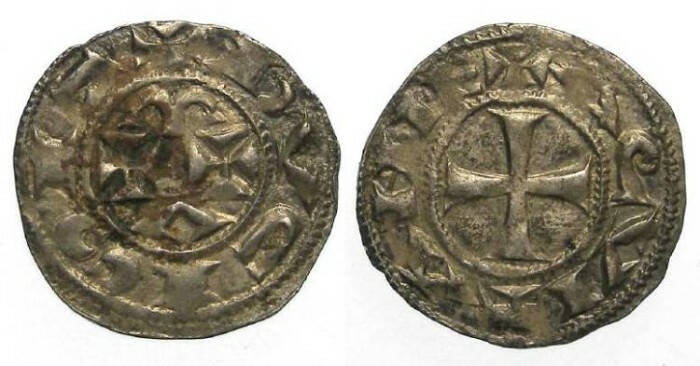 These particular coins do not name her, but do have an inscription that contains a word that may translate as Duchess, which would indicate they are her coins. This theory is not proven, but you will find a discussion of the evidence in the Elias' book on Anglo-Gallic coins, where he backs the idea these are coins of Eleonore. Denomination : Silver denier. Mint : Bordeaux. Date : probably issued some time just after AD 1189. Size : 16.5 x 17.3 mm. Weight : 0.83 grams. Grade : XF with a brown stain on the obverse (which probably could be removed is you wanted to). Attractively toned. Obverse : M A with two small crosses, all in a circle with DVCISIT around. Reverse : Cross pattee with AQVITANIE around.